The idea for the Ko-Falen Cultural Center began after years of family visits to Bamako by founders, Baba Wagué Diakité and Ronna Neuenschwander. Year after year, fellow artists and friends traveled with Baba Wagué and Ronna to visit Wagué’s home country and to learn about Malian art and culture. It was discovered during these visits that the sharing that came with art making was an easy and comfortable introduction into the culture. It was felt that this sharing offered a larger opportunity by building a place where people could come and experience art and culture side by side with Malians. In 2001 Ronna and Wagué bought the land on which the Center is situated. In 2002, architectural plans were approved and the septic system and foundation were built. In 2003 the first story walls were completed. From 2004-2007, by the generosity of individual donors, the Center was built, brick by brick, by local neighbors and American visitors, family and friends. While the Center itself provided space for sleeping rooms, a kitchen and meeting space, it did not provide an area where workshops and classes could be taught. Local neighbors and Malian artists suggested that the mango grove adjacent to the Center would be an ideal place to hold workshops, to which everyone agreed. In 2007 Ko-Falen began the process of purchasing a section of the mango grove adjacent to the Center in Bamako. Working outdoors on the art projects gave a natural invitation to the neighbors and passers-by to join in. The Ko-Falen Cultural Center was officially inaugurated on New Year’s Eve, 2007, with approximately 35 Americans joining forces with the Boulkassoumbougou neighborhood in Bamako in which the Center is located. The US Ambassador to Mali joined the celebration, along with his family and staff. Currently, Ko-Falen Cultural Center is preparing to launch another series of workshops from December 2009 – January 2010. In order to facilitate these formidable educational opportunities, workshops must be filled, and generous gifts are necessary to stabilize, expand and grow. I Diakite, i ni fama! An ye nyogonye Bamako tuma do la, nga a mena kuy. N b’a fe k’i fo. I ka baara kanyi de! Allah ka nye ka d’a ma. O be diya n’ye kosebe n’anw sera ka bolo ani hakili nyuman di nyogonma. I k’an ka website laje wallasa k’an ka baara don. An ka djekulu togo “ECOVA MALI” (www.ecovamali.org) . Ka nyogonye nogoya. Ko-Falen Cultural Center is a tax-deductible 501(c)3 nonprofit organization. 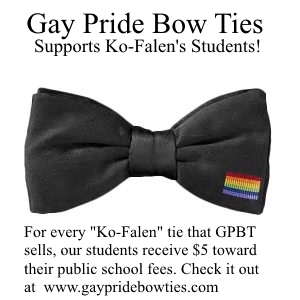 Ko-Falen is only able to continue its work of making meaningful connections across cultural divides with your help. Donate today and be part of our movement to create greater respect and understanding between people. > I say with pride-thanks to you!!! - A to tora ne ta ye. > Now it is my job that will follow.